The United Nations Environment Programme celebrates World Environment Day on 5 June this year. The idea behind WED is to ‘celebrate positive action for the environment’. Tree plantings and naming baby gorillas provide Rwandans with an opportunity to celebrate their country’s rich ecological niche. Bahrain organised a Cultural Environment Week which folds in nicely as a part of the International Year of Biodiversity. Arts and essay competitions along with photo exhibitions have been combined in many countries with invitations extended to local artisans to create works that focus on biodiversity and the ecological riches found the world over. Contrast the idea of WED to the travesty occurring in the Gulf of Mexico at the moment. An oil-covered brown pelican found on the Louisiana Coast on 4 June 2010. Photo by Win McNamee/Getty Images, reposted from The Huffington Post. 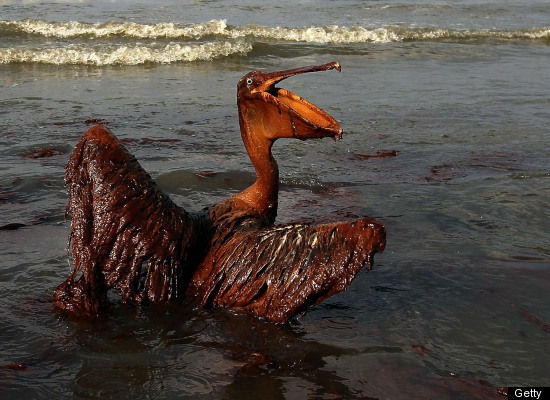 A few days ago, new images of pelicans and other seabirds, dead fish and dolphins appeared, all of which were covered in oil from the Deepwater Horizon oil spill. The images were vile and stomach-churning to say the least. I’ve seen a few news items within the past few weeks where some claim that the impact on the eco-system surrounding the spill won’t be impacted too badly. The damage won’t be ‘that bad’. My question to those who make such claims is this: what do you consider ‘not that bad’? There are so many things about the tragedy in the Gulf that impact those beyond the workers on the platform or the company (-ies) losing precious cash. Those who live in the Gulf will be perhaps impacted the most—from the fishermen who benefit from the delicate eco-systems to those who work in the tourism industry in a region of the US that is amazingly beautiful. With news that the Gulf currents could extend the effects of the spill up the Eastern seaboard and beyond, another place close to my heart could also be profoundly impacted—Cuba. If it took the area effected by the Exxon Valdez oil spill 30 years to recover, how long will it take the Gulf? And, is the immediate pay off worth the sacrifice? Our—Americans’—reliance on oil is and has been gluttonous. On World Environment Day, shouldn’t we consider the impact of that gluttony and move towards less detrimental means of enjoying our way of life?